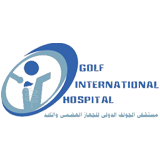 Golf International Hospital specialized in the treatment of the digestive system and liver diseases for children. as well as there is units obesity treat and surgery. There is units for the digestive system and liver tumors. The existence of emergency department works 24 hours. Has a hospital ambulance equipped to transport her illness to and from the hospital throughout the day.There are three units of Gastrointestinal Endoscopy kinds.Two operations equipped with high technological devices. Intensive care unit equipped with the highest international level.Radiology.Alone to measure the movement of the digestive tract. Dr. Mohamed Amin Sakr MSc , MBBCh , M.D. Dr. Ahmed Saber MSc , FRCP , MBBCh , M.D.